'Abdu'l-Bahá's Journey in the West . . .: May 14, 1912 A new spirit! Lake Mohonk conference of the International Peace Society: "a new spirit and excitement"
Mahmud writes: "As `Abdu'l-Bahá was invited to Lake Mohonk, the venue for the conference of the International Peace Society, He made preparations to leave. This conference was the greatest of all the peace conferences in America. It was held in a most ideal location and many dignitaries and delegates from various countries had been invited to attend. Lake Mohonk is four hours away from New York by train. At the train station special landaus [four-wheel carriage with a top divided into two sections and a raised seat outside for the driver] were waiting to take the guests to the conference site. The Master took one of these and went to the Hotel Lake Mohonk. He praised the beauty of the place and the scenic grandeur of the route as His carriage drove for about an hour amidst green valleys, wooded hills, woodlands, waterfalls and natural springs. The conference was to last for three days. Each day two long sessions were held in the spacious hall of the hotel facing the lake, the hall having been especially built for the conference. On the first evening, `Abdu'l-Bahá's name was at the head of the program. All the members and delegates were anxious to hear His address. The president [of the International Peace Society, Mr Albert K. Smiley] introduced the Master with the utmost respect and glowing words of praise. Then `Abdu'l-Bahá stood and spoke. A new spirit and a new excitement seemed to prevail over the gathering. During the day most of the delegates had been engaged in materialistic issues. Their thoughts had been concentrated on effecting the union of the interior of the United States of America. In the evening, however, they found themselves puzzled when they heard the eloquent, elegant address from the Master concerning the unity of all people, the reformation of the whole world and the Manifestation of the Greatest Name which would bring about the oneness of the world of humanity and the promulgation of the teachings of universal peace. He spoke for about 20 minutes, the time allotted to Him in the program. According to the custom of the West, the audience applauded for a long time when He ceased speaking. They requested that He continue but because He was tired He apologized and with a gesture of His hand bestowed kindness on all. One by one, dignitaries and delegates from many countries came to shake His hand. Some of them embraced Him and expressed their thanks. The president again stood, offered thanks and spoke with great reverence on the importance of the teachings, praising and commending `Abdu'l-Bahá on behalf of the audience. Mr Smiley's wife then gave the Master a pendant especially made for the peace conference and thanked Him most joyfully." Don't you wonder if this pendant exists in an archive somewhere? It's hard to imagine the days He spent at Lake Mohonk fully, based on Mahmud's accounts. He doesn't tell us who went with `Abdu'l-Bahá to the conference, aside from Dr. Zia Baghdadi and himself. Juliet simply says, "On the fifteenth of May [it was actually the 14th] the Master went away for a few days." Luckily, Rob Stockman in his new book shares information from Ahmad Sohrab's letter to Agnes Parsons: "He was so exhilarated by the beauty of nature, charming sceneries of mountains, valleys, plains and the verdant forest of trees and wild flowers that he [`Abdu'l-Bahá] burst into songs of happiness commanding others also to sing. Lua and Fareed sang some Persian songs written by Abdul Baha, then Mr. Mills being a good singer was asked to sing. All through the seven miles [sic] drive the party of four sung in whole and in turn while Abdul Baha out of the sheer joy applauded them. 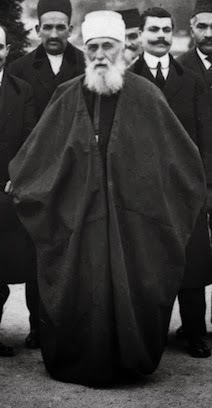 It was a never [sic] memorable incident which has seldom happened in the life of the Master and Doctor Fareed could not remember throughout all his service and travel with Abdul Baha of a similar occasion [May 15, 1912, Agnes Parsons Papers]. Wouldn't we all have loved to be in that party? Can we hear that music in our imaginations now? When we went to Lake Mohonk to film (just a few weeks ago), we did rent a carriage ($400 for half an hour) to recreate that scene. The camera had to take the POV of 'Abdu'l-Baha, since we couldn't show Him in the scene! Brian Kurzius of New Paltz emailed to say he could show us the original gate to the Mountain House--and he did! It was a splendid day, all around. It must have been nice for the Master to get away from the city and spend a few days in such a beautiful and restful place--in a building that is still there now, owned by the same family! The Lake Mohonk Conference on International Arbitration was founded in 1895 for the purpose of creating and directing public sentiment in favor of international arbitration, arbitration treaties, and an international court. 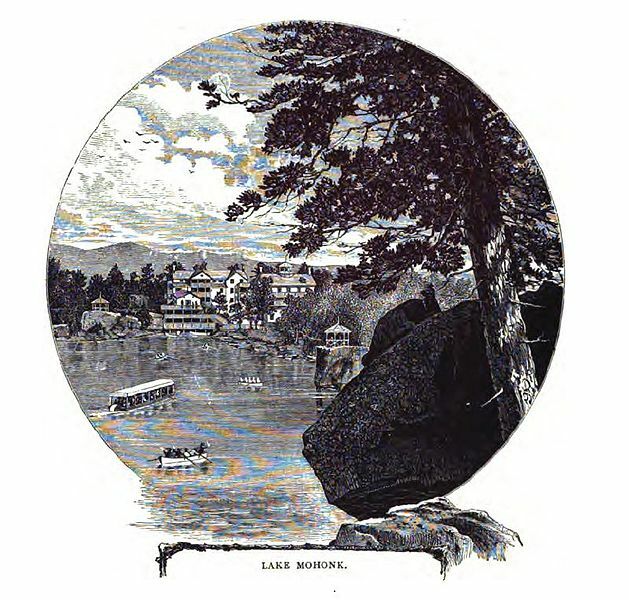 The first Lake Mohonk Conference on International Arbitration was held in June 1895, at Lake Mohonk in Ulster County, New York. Fifty eminent American men were convened by Albert K. Smiley, a Quaker and the owner of the Lake Mohonk Mountain House, one of the most prestigous summer resorts of the day. The annual conferences soon grew to attract 300 leaders of government, business, religion, the press, and education. After Albert Smiley's death in December, 1912, his place as host of the Conferences was taken by his half-brother, Daniel Smiley. The last conference was held in 1916. Plans for a 1917 conference were made, but it was never held. From Wikipedia: The Mohonk Mountain House has hosted many famous visitors over the years, such as industrialist John D. Rockefeller, naturalist John Burroughs, industrialist Andrew Carnegie, and American presidents Theodore Roosevelt, William Howard Taft, Rutherford B. Hayes, and Chester A. Arthur. Guests have also included Former First Lady Julia Grant, Thomas Mann and religious leaders such as Rabbi Louis Finkelstein, Reverend Ralph W. Sockman, Reverend Francis Edward Clark and `Abdu'l-Bahá, the eldest son of Bahá'í Faith founder Bahá'u'lláh, have also stayed there on one of his journeys to the West. 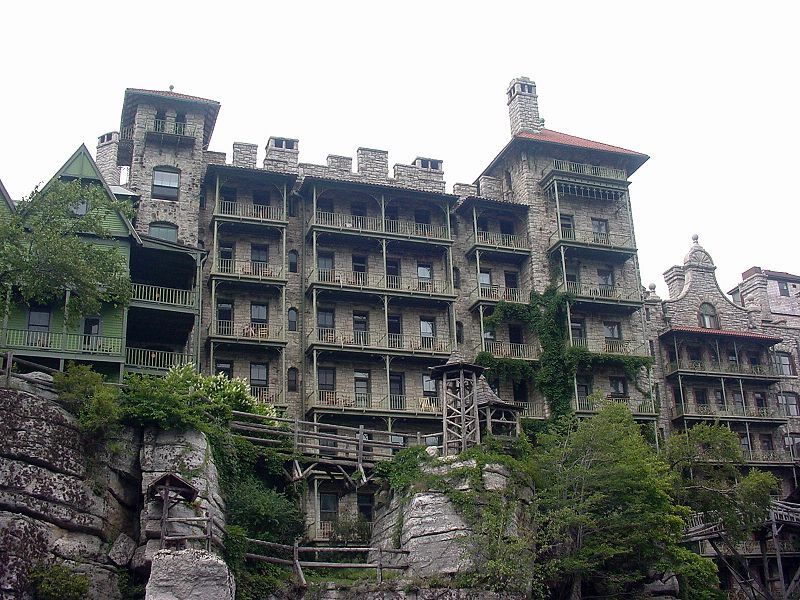 From 1883 to 1916 annual conferences took place at Mohonk Mountain House, sponsored by Albert Smiley, to improve the living standards of native American Indian populations. These meetings brought together government representatives of the Bureau of Indian Affairs and the House and Senate committees on Indian Affairs, as well as educators, philanthropists, and Indian leaders to discuss the formulation of policy. The 22,000 records from the 34 conference reports are now at the library of Haverford College for researchers and students of American history. The hotel also hosted the Lake Mohonk Conference on International Arbitration between 1895 and 1916, which was instrumental in creating the Permanent Court of Arbitration in The Hague, Netherlands. From http://rogershepherd.com/WIW/solution8/mohonk2.html: The Lake Mohonk Conferences on International Arbitrationbegan in 1895 as an attempt to seek world peace. The conferences are credited with having given impetus to the Hague Conference movement, The World Peace Foundation, and The League to Enforce Peace. Hundreds of well-known people attended the peace conferences between 1895 and 1916 including William Jennings Bryan and William Howard Taft. 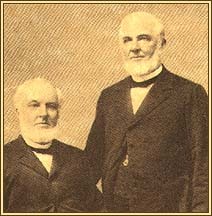 It was through his contact and friendship with the Smileys at Mohonk that Andrew Carnegie founded the Carnegie Endowment for International Peace, with Albert K. Smiley as one of its original trustees.